I’m pretty sure they used some automatic translator. I guess the original text was something like “Commission-free for all trades in foreign currencies”. The “-free” bit can be quite tricky: we don’t have anything like that in Italian. As an adjective, “free” is actually translated as “libero” (or “libera”, if feminine). 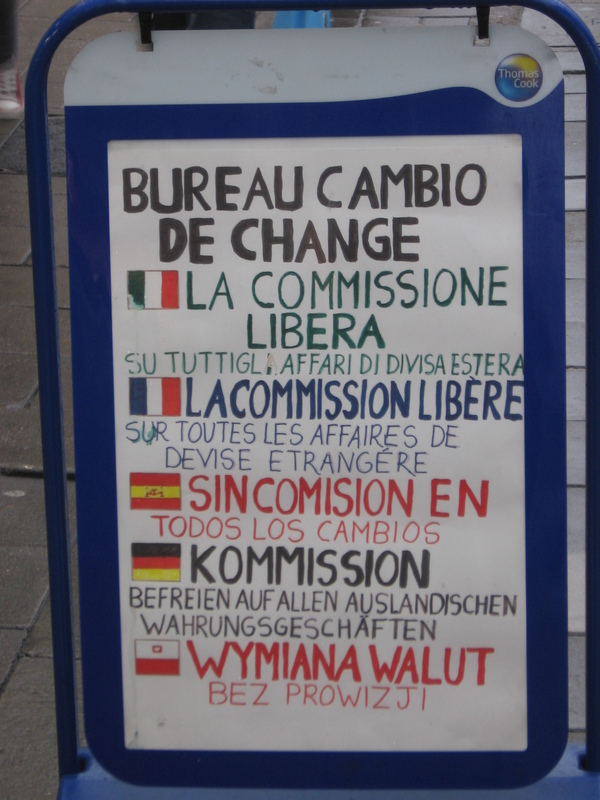 That’s why the slow-witted translator went for “la commissione libera”, which means “the free commission”, and obviously doesn’t make any sense in the context given. When you want to translate a “X-free” word into Italian, you need move around a bit. Most of the times, you will make it by choosing the “senza X”, “niente X” or “nessun X” form, or even the more bombastic “zero X”. In this case, I would go for “NESSUNA COMMISSIONE / su tutte le transazioni in divisa estera”. ← I’m in Brighton, at last! No, Matteo, di Eco ho letto diverse cose quand’ero studente, ma questo mi manca. Forse è molto più recente… Comunque grazie per la segnalazione, proverò a darci un’occhiata!